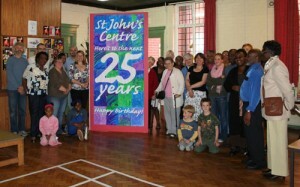 The Centre Project was started in 1982 by St John’s Church in response to the Moss Side riots . A handful of volunteers opened the hall for unemployed people to come and share their skills, enabling them to gain confidence, feel valued and meet with others in a similar situation – in many ways similar to how the project works now. We were successful in securing Urban Aid funding for 5 years, to employ a full-time Project Coordinator. This later became two part time Coordinators with an Assistant/Caretaker. The capacity of the project was built after securing ERDF funding in 2002. In 2017 we have a full-time manager and six part-time members of staff. We are supported by over 30 volunteers. Our income comes from hire of the building, supplemented by charitable donations and grant funding. We currently receive grants from the Big Lottery’s Reaching Communities and Awards for All funds, Manchester Diocese’s Parish Mission Fund and Council for Social Aid, the Garfield Weston Trust, and Trafford Housing Trust’s Community Panel. These pay for building and staff costs, and specific projects. We do not receive any funding from Trafford Council.